 Tankvagn typ DB "Eva"
Denna produkt ger dig 354 bonuspoäng. Tankvagn typ DB 'Eva', längd över buffertar 14,6 cm, epok III. Prototype: Four-axle pressurized gas tank car used on the German Federal Railroad (DB). Privately owned car painted and lettered for the firm Eisenbahn-Verkehrsmittel GmbH / Railroad Transportation Services, Inc. (Eva). 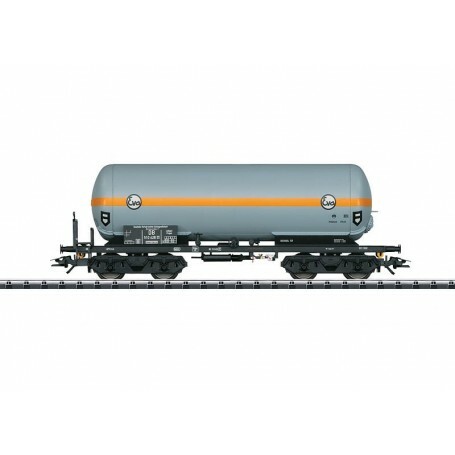 Model: This is a pressurized gas tank car without a heat shield. It has a detailed partially open frame. The side sills are 'U' shapes with lugs. The trucks are a Minden-Dorstfeld design. The brakeman's platform is separately applied. Length over the buffers 14.6 cm / 5-3/4'. DC wheel set E700150.